Shirts With Random Triangles: Ohio St. Starting QB J.T. Barrett Suspended After Alcohol-Related Arrest. According to Eric Seger of Eleven Warriors, Barrett was arrested after Columbus Police noticed him trying to avoid an OVI checkpoint. Barrett was given a breathalyzer test, and registered "slightly over Ohio's legal limit of 0.08 blood-alcohol concentration." Barrett was reportedly released into the custody of Ohio St. QB Cardale Jones. 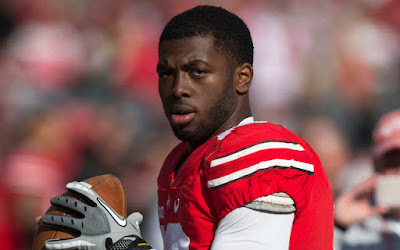 Barrett could face a two-week suspension for violating the Ohio State athletic department's student-athlete and alcohol program. UPDATE: ESPN's Brett McMurphy reports Barrett will be eligible for Ohio State's Nov. 14 road game against Illinois.